Your instructions will be hard to follow, why do you want to write it as a recipe on a stupid website, it’s easier to invite you friends round and just show them how to make it, by cooking it for them. I’m hoping some of you prove her wrong, else I’ll have to start inviting people round, as a matter of honour! Start off by chopping up onions into either a rough dice or fairly course slices. Also chop up the chillies and the garlic and place in a large cooking pot. Grate the ginger into the pot it’s up to you how much use, as is the case with garlic and chillies, these amounts reflect how much I normally use when cooking 2lb of Mutton. Add the meat to the pot. Also add 2 tablespoons of curry powder ( or less if you dont want it too hot ), add the passata, the sunflower oil, some salt and pepper. Stir the pot well making sure the meat is covered evenly by the passata, oil and curry powder. Place the pot on your cooker and turn the heat all the way up! ( trust me! ) cover the pot with a lid and leave it there for a few minutes. What should happen is that as the heat quickly builds up in the pot the meat will start to release its own liquid and juices and within about five minutes if you take the lid off you should see theres enough liquid to almost cover the meat, without you having to add any extra. At this point chop and add all the corriander stalks you have to the pot, and stir. Then cover, ensure the lid remains on, and the heat high for about a quarter of an hour. 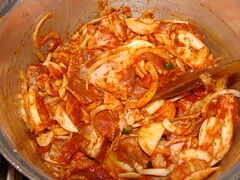 Then take the lid off and stir well before, replacing the lid and simmering on a low heat for about 40 minutes. During this period you might want to stir the mixture a couple of times to ensure it doesn’t burn or stick to the bottom. After forty minutes the meat should be tender(, if it isn’t you might want to add some water, bring to the boil and continue to simmer until it is tender). With the meat tender, remove the lid and turn the heat up. You need to continuously stir to prevent the mixture sticking to the pan and burning since you need to completely dry it out. You’ll know you are done when the oil has completely seperated from any residual liquid and the meat with its viscous spicy coating takes on a dark color. Also at this stage the onions and other ingredients you added should have completely dissolved and disappeared into the mixture. 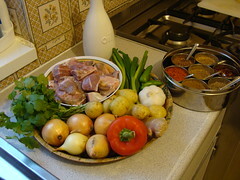 Chop up and add the fenugreek, also add the ground corriander and the garam masala at this stage and stir well into the viscous mixture. *Note: This used to be stage of cooking where, as a kid, I’d sneak into the kitchen and pick out a piece of meat, put a sprig of corriander on it and pop it into my mouth before my mom caught me. The explosion of spices with the corriander will blow your head off if you aren’t used to hot spices but it tastes divine. By the way the process of stirring and drying out all the liquid is what we refer to as ‘Bhuna’, if you’re ever in an Indian/Pakistani/Kashmiri restaurant and you see a ‘Bhuna’ dish on the menu it’s effectively a curry served at this stage. 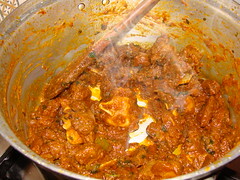 With the bhuna dry and the spices mixed in, add the potatoes and stir in. Cover the entire mixture with a jug of water, and bring to the boil. Leave it boiling for about 5 – 8 minutes. Then simmer on a medium heat for a further 15. 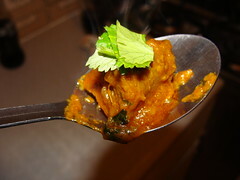 After simmering add all the chopped up corriander leaf and stir in. Also sprinkle the cumin on and either leave it to rest, or leave it on a very low heat. At this point you are ready to serve, which you can do so with rice or chappati’s. Given that my instructions might not be the easiest to follow :p I took a load of pictures as I was cooking this and have posted them, with captions, in a set, on flickr!